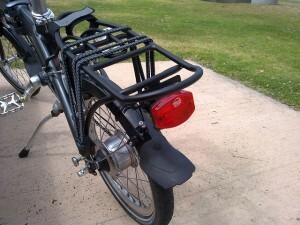 It’s part of Dutch culture to transport a friend or your partner on the rear rack of your bicycle: the ‘bagagedrager’. Although ‘bagagedrager’ in theory can mean ‘any luggage carrier’, in the Netherlands it’s almost exclusively used for bicycles. As the name implies, originally meant for luggage or whatever goods you are transporting, however in practice it is mostly used to transport another human being. In Dutch this is called: ‘iemand achterop nemen’, where ‘achterop’ means something like ‘on/at the back/rear’. 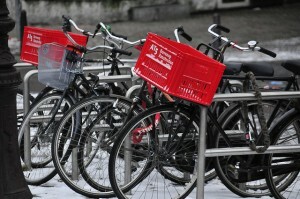 When sharing a bicycle, common questions are: ‘Ga jij achterop, of ik?’, ‘Zal ik bij jou achterop gaan?’ and ‘Mag ik achterop?’. When invited you may hear ‘Kom maar achterop’ or ‘Spring maar achterop!’. A popular song at the moment in the Netherlands is ‘Bagagedrager‘ by Dutch rapper Gers Pardoel (ft. Sef). You have been introduced to Gers Pardoel in DWOTD Animatie. This is the second hit of his debut album ‘Deze wereld is van jou’ (‘This world is yours’). I have chosen this song because of its seeming paradox: tough rappers use rough language to rap about giving girls a ride on their bicycle. 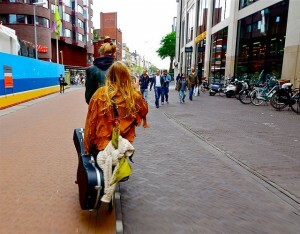 The song lyrics are also informative due to the occurrence of typical Dutch phenomena, such as obviously the ‘bagagedrager’, but also Dutch bicycle brand ‘Gazelle‘, buying a bicycle for 10 euros (or guilders for those old enough) from a junkie, and the Dutch yogurt drink ‘Fristi‘. En ik had d’r nog wel zo lekker genomen, maar eindstand: had ze m’n fiets gestolen! 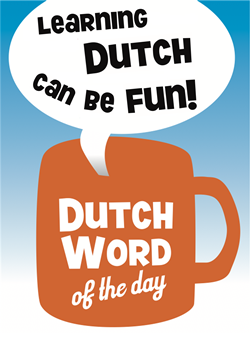 This entry was posted in Dutch songs, Dutch word of the day, DWOTD 1.0, Vocabulary Basic and tagged bagagedrager, donnie, fiets, Gazelle, gers pardoel, Sef by Sander. Bookmark the permalink. Great post, pity I can’t listen to the song right now, but I will do it today for sure! I remember my first ride on ‘bagagedrager’ in the Netherlands; that was fun! So, she stolen his bike and he bought new one for 10 euro, is it right?